Spring is truly bursting out all over Paris. 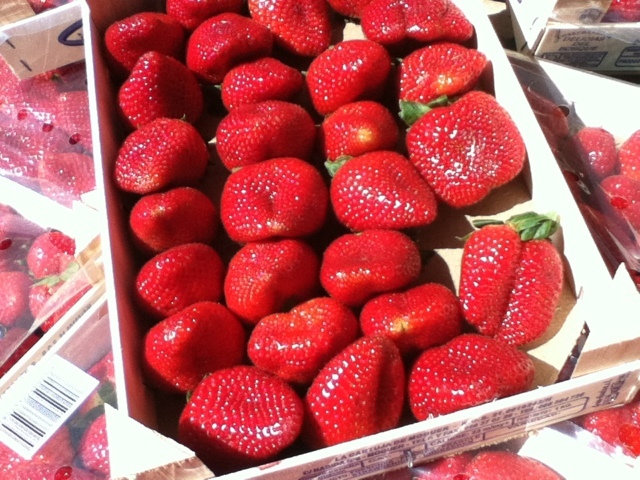 You can see it in the marche with all the stacked boxes of fraise and asperge blanc. 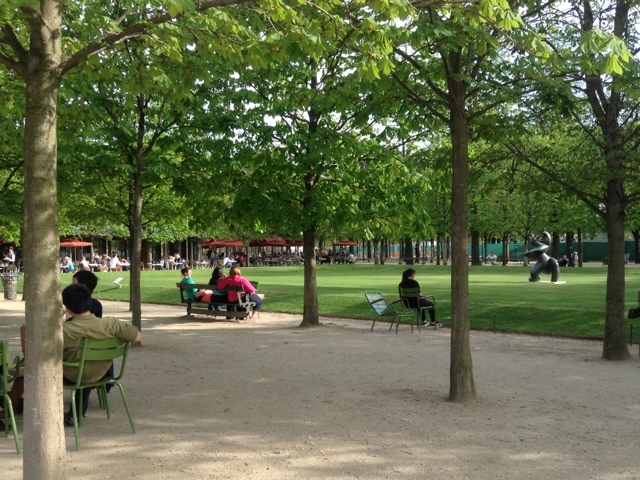 The Tuileries is crowded with Parisians lolling around semi-dressed. 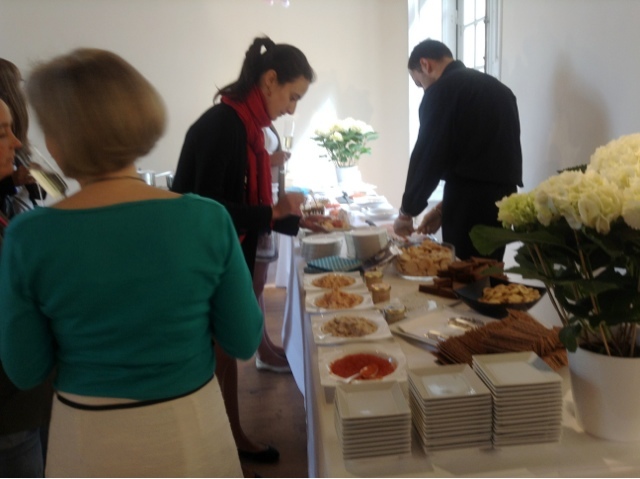 Monday I went with Chef Marthe to a special outdoor brunch given by Petrossian at the very divine l'Institute Suedois in the Marais. If you haven't been do go. There are always art exhibits on and the cafe serves excellent Swedish fare. 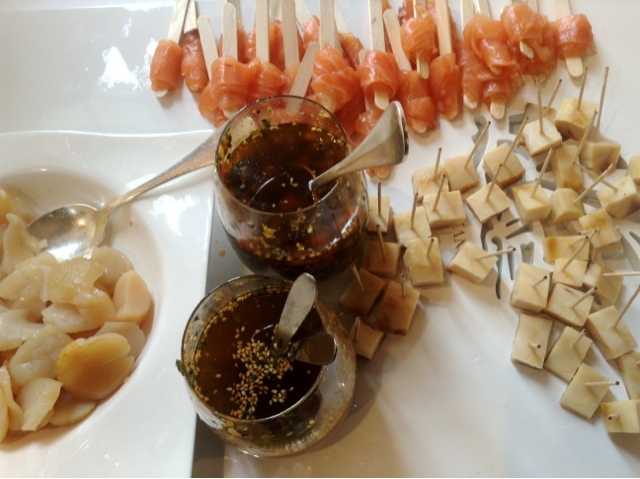 But Monday it was strictly caviar, champagne, smoked salmon in endless new variations. Noix de Saint-Jacques fume, Coupe du Tsar salmon nature with dill. 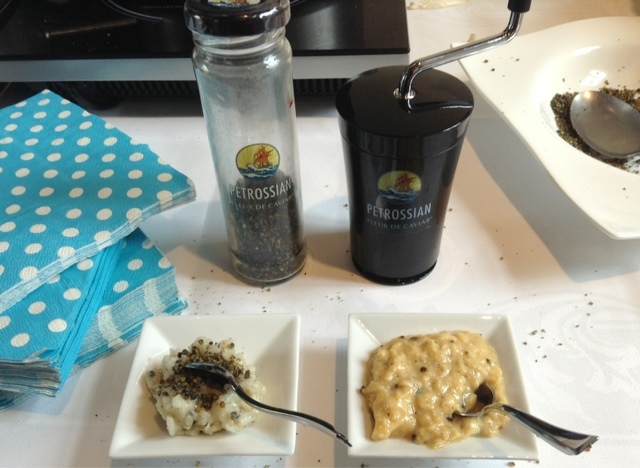 A new creation - dried caviar/la Fleur de Caviar to sprinkle on your risotto or scrambled eggs. 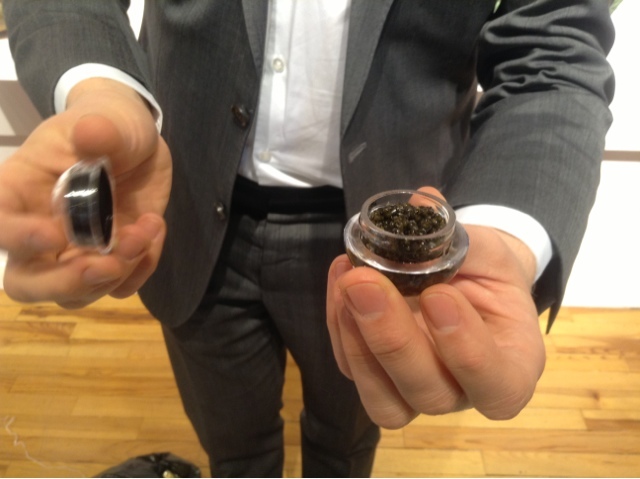 New little individual servings of caviar perfect for your spring celebratory picnics. 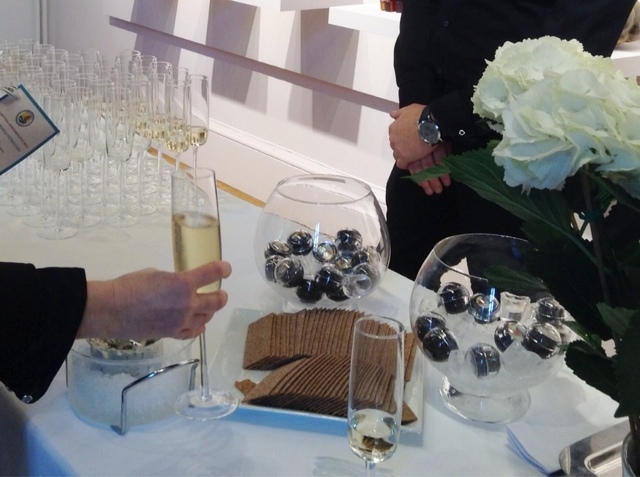 Caviar is now raised all over the world - it tasted wonderfully by the way and just the perfect amount. 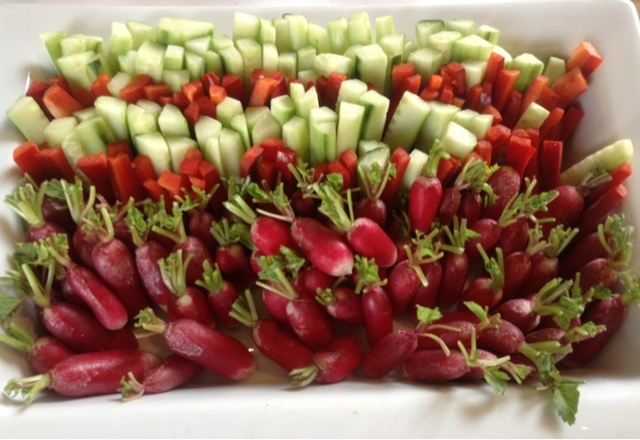 Loved as well this colorful arrangement of French radishes, carrots and cups. Everything was served in new ingenious ways. I have to run now to catch the gorgeous Spring weather before Paris rain clouds change their minds. *I'm thinking of adding a weekend edition of Parisbreakfast. I do so much in a week I can't keep up. What do you think? Oui or non PBers? When in Paris I always stay in the Marais. I have seen the Institute Suedois but didn not know what it was. I did see cafe tables...can any one go into the cafe for food and to look around? Since I do not speak French or Sweedish I did not know how to ask in person. I will be back in the Marias in abaout two weeks and would like to go inside. Any advice? There's a link to their website in the post. Of course a weekend edition, Carol! Your blog is a treasure trove of info/eye candy. I love checking in daily ... even several times to read comments. Quel plaisir. The more information the better! But don't wear yourself out just to keep us informed. 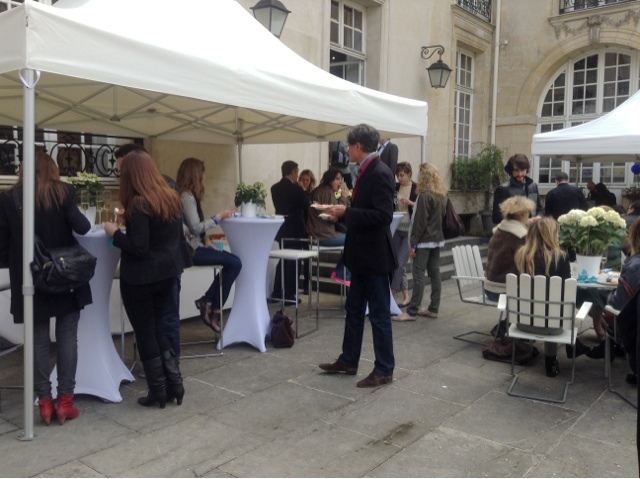 By the way we were in Paris last Sunday - brought the beautiful weather with us (you are welcome, Paris!) and enjoyed a picnic in the park with all the rest of Paris - what a wonderful day! I vote yes! Weekends would be fabulous if you want to do it. Great idea. It would sure add to my weekend's pleasures. Thanks for all you share. The caviar looks fantastic! I would love to try the dried sel. fun stuff! Merci! I think no! I think you need your weekends free and not to be always working...invites burnout, but that's just me. LOVE the post!! Your blog is always a pleasure to view. I look forward to it everyday to see what is going on elsewhere. Weekends sound great to me! I love your blog! I am voting yes for a weekend edition. By the way, can you identify the poster in the last frame of your blog today? 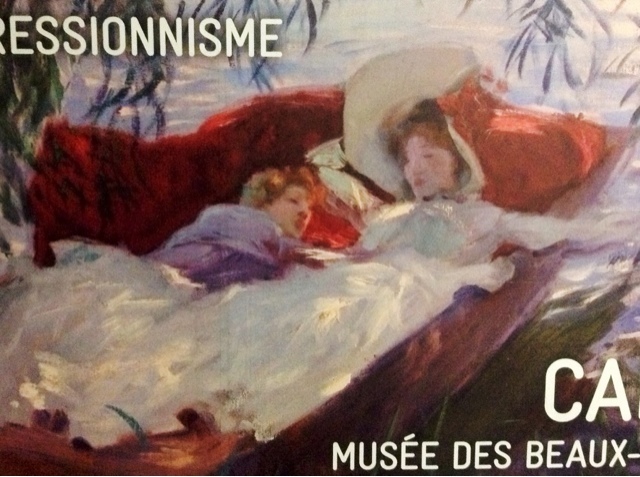 It caught my eye and since I’ll be in Paris a month from now, I’m wondering if it’s for a current exhibit? Thanks for providing a little slice of Paris every day. That little container..be still my heart. I would love it! I always miss PB on the week end. But, perhaps, to avoid burnout, just feel free to skip it now and then if you are super busy or worn out from all your jaunting about. Weekends - oui! Can't get enough PB to drool over! Oui!! Weekend PB? Tres bien! Musee du Moyenne Age and Musee des Arts Decoratifs so I am way behind! 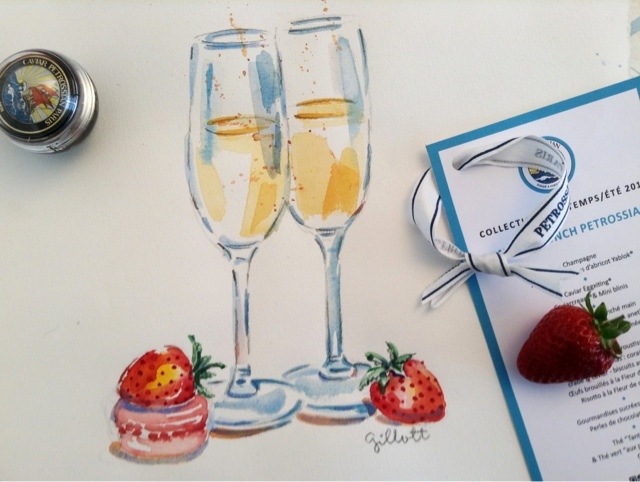 Thanks for sharing your Paris adventures! Yes please on the weekend edition. Love reading what you are seeing there. I like the shot of the strawberries - they really jump out at you. I've never had caviar - I'd love to try it. Strawberries have been jumping out at me all over Paris. I finally bought some in the marche and they were delicious! Oui! Oui! Oui! A weekend edition for folks like me who get their in-between-paris-visit-fixes from your fabulous blog! Best regards, Rebecca. Loved this post Carol. Weekend posts would be gratefully received by this daily reader in Australia. Boujour from Sao Paulo – Brazil!! OUI OUI!!! Paris Breakfast on weekends too!! I can´t wait to receive your daily Paris Breakfast everyday , the pictures and your comments on what is going on in Paris regarding expositions, food, parisian´s style and life and Bear the most lovely little guy ever! It makes my DAY! Oui! I save all of your blogs and can't wait to see and try some of the places you recommend when I come in May. Thank you, it's so great to see your art and clever ideas. 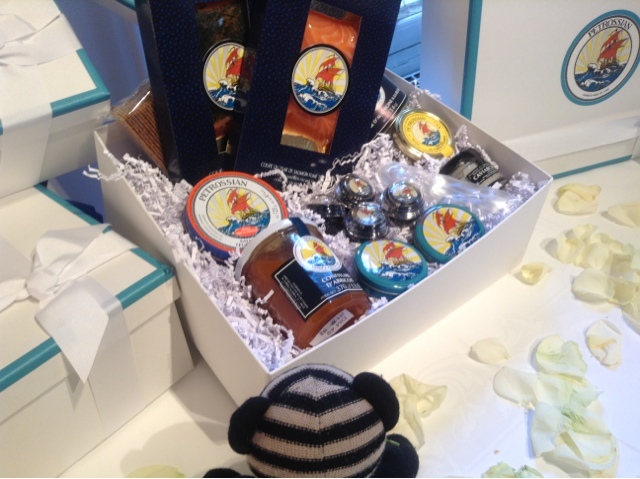 Bear flirting with the petrossian food! Mais oui,Carol! A weekend edition would be wonderful! Even though I'm not wild about caviar, your post today had my mouth watering.YUM! Bien Sur!!! A weekend edition would be a much anticipated treat pour Moi! I'm a bit behind reading PB this week but it's always a pleasure to read through however many posts you've made for us. What a breath of spring this post is. Those strawberries do look magnificent. 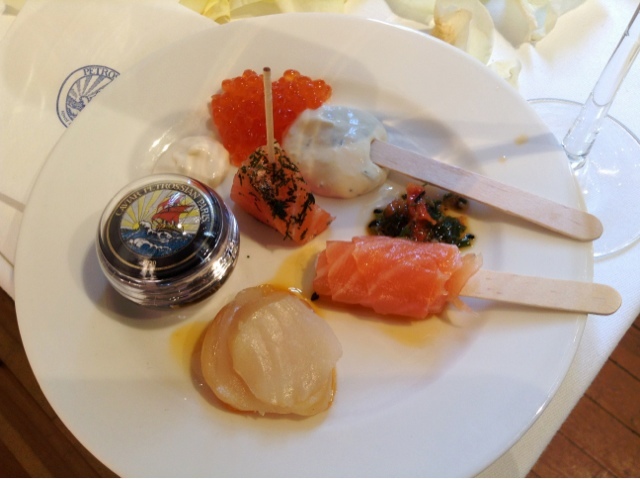 As does your Petrossian taster plate. I'm intrigued by the dried caviar concept.